Today’s route promises an easier day, but that’s not always the case on a bike tour. It started with coffee and breakfast from the Largo Café. The server there said she even remembered me from last year – says she never forgets a face. Quick stop at the Country Store. We had sandwiches and plenty of leftover nibbles from yesterday so only picked up a Gatorade. South down NM32. It was then I discovered I’d been bitten last night, almost certainly by bed bugs. Six or seven bites down the torso, which itched a lot under my bike clothing. We passed the Quemado Cowboy Church, which I thought was a pretty cool name. 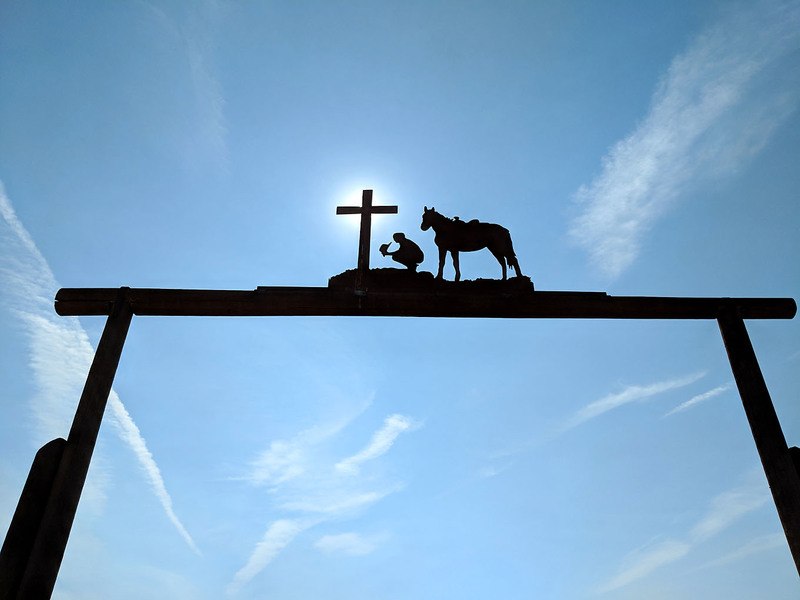 Isam took a great photo of their ranch-style gate, capturing the sun perfectly behind the cross. 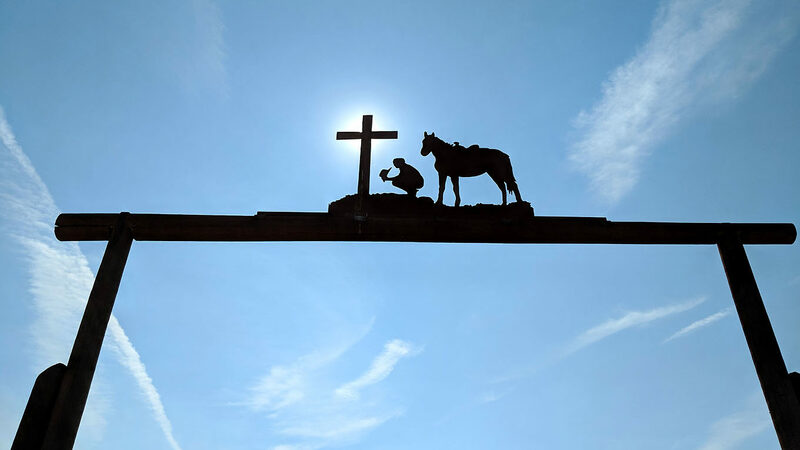 Awesome photo. A bit further I was rolling along watching a hummingbird zip along with me. The bird then darted out in front and crossed the road, unfortunately getting caught in the bow shockwave from an oncoming pickup. I clearly saw the bird was at least 5 or 6 feet away from impact, but still it spiraled upwards and fell quietly to the ground. Isam and I gathered around to investigate. The bird kept twitching so we estimated it would recover in time. Isam carefully scooped it up away from the road shoulder and placed it in the shade of a plant. Good luck hummer. NM32 continues on a gradual path upward to about the 25 mile mark. We stopped a few times on the way and eventually settled in for a snack lunch at the Jewett Gap Rest Area. From there, our maps showed a 2,600’ drop to finish the day, but you know, you never quite know what you will get on tour. The southbound lane of NM32 turned to sealcoat. That’s a cheap repair strategy involving a layer of tar followed by a layer of gravel. This gravel had been very recently dumped, and so it hadn’t had time to settle into the surface. Result? For a bicycle that means a rough jarring surface with increased rolling resistance and decreased traction. At first I hoped the chipseal would only last a few miles, but it continued nearly all the way to Apache Creek, for over 15 miles. On top of this, add a headwind. You know, it always seems quite unfair to have to peddle downhill. At the Apache Creek General Store, Isam and I agreed it had been unexpectedly tough on our shoulders, hands, and minds. The phrase “F**k the gravel” was expressed at least once. Isam bought some bungie cords because his (Phil’s) trunk kept slipping off the rear rack. We also picked up an onion, brown gravy powder, a can of Spam, and a box of rice with a plan to cook dinner for ourselves tonight. Outside a couple of hummingbird feeders were buzzing with activity. Dozens of hummers would feed at once, along with a handful of wasps. Isam shot some great video, especially cool when played back in slow motion. A final 12 miles to Reserve was mostly downhill, hindered only by the continued headwinds. 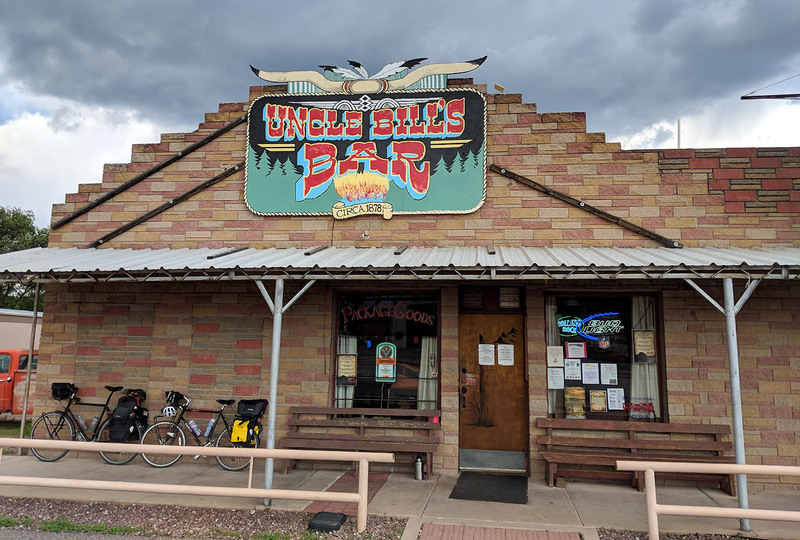 We soon rolled up to Uncle Bill’s Bar for a much needed beer. We got a laugh inside. The barmaid was fine with my order, but asked Isam for his ID. Isam is 34, so the request was already odd. He handed over his ID from Spain, and pointed out the 2 dates on it, one his birthdate (in the past) and the other the expiration date (in the future). She wrinkled up her face, looked warily at the card, then stated that bars can’t accept this card because it is in Spanish and “we” don’t speak Spanish. <sigh> It seemed just lazy to me. Just use your brain for one second and look at the birthdate. To our contentment, she brought Isam a beer anyway, doing us a favor as it were. Two Blue Moons with orange slice – what we needed! Rains dumped outside. Like yesterday, we were fairly happy to be off the bikes and finished with today’s ride. With the gravel and winds, it had been more work than we’d expected. Next stop – Jake’s General Merchandise for the remaining dinner ingredients. 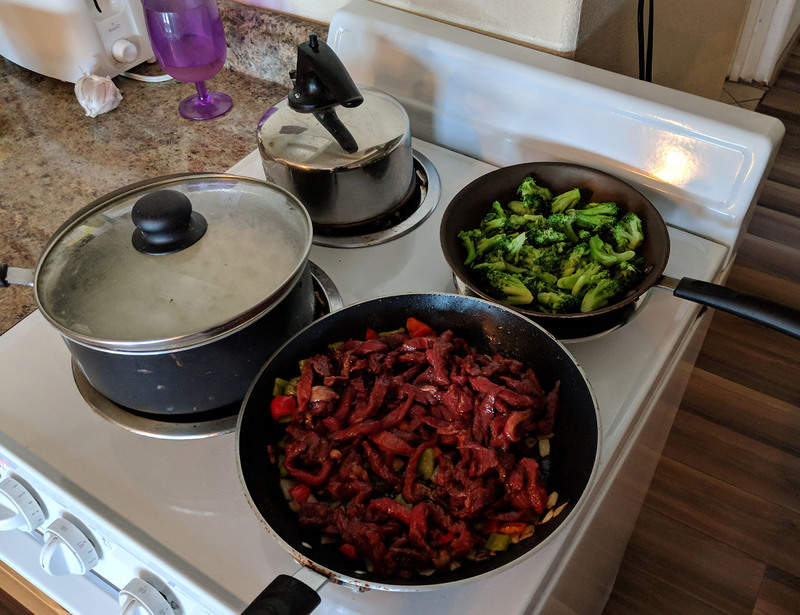 We found frozen broccoli, garlic, soy sauce, green and red peppers, and some stir-fry beef. And butter. Don’t forget the butter. We decided a bottle of wine was in order, and returned to Uncle Bill’s. I asked for something like a Pinot Grigio, but the barmaid just screwed up her face at me. She then said, “All our wines are up there.” Gestering upward, the bottles were perched behind the bar next to the ceiling. Can’t read a thing. I asked if I could come around to take a peek, but was told that’s illegal. They sure have screwball rules at this bar. Or maybe just ridiculously careful ones. Then, once again, she relented and allowed me behind the bar to read the bottles. I picked out a New Mexican wine: St. Clair Pinot Grigio. Perfect. Final stop – the Frisco Lodging Company south of town. They have a phone pick-up check-in, then you get your room key from a safe mounted in the stone pillar of the porch. Pretty cool and VERY efficient. Our room was excellent, with 3 beds plus an equipped kitchenette. Excellent! Typical post ride- evening, but this one had some highlights worth mentioning. The St Clair pinot grigio turned out to be quite nice. Isam took charge of cooking and everything came out fantastic. Generous portions of garlicked broccoli, sautéed tender beef with onion, green and red peppers marinated in soy, buttered rice. Does it get any better? Yes. The Shawshank Redemption on TV! 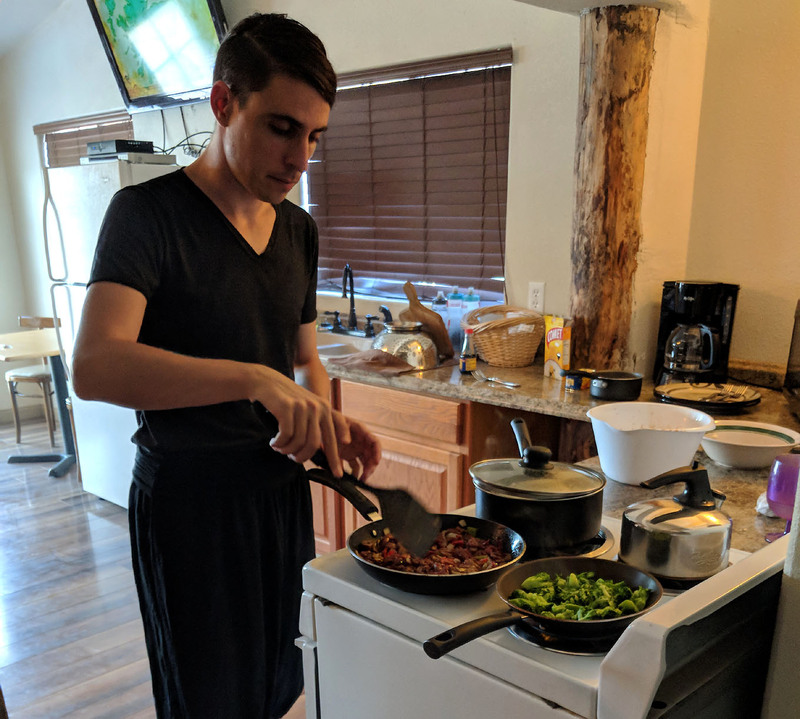 Dinner in progress – thanks Isam! Gotta get up early tomorrow. Many miles to go and many feet to climb.